The best sales jobs are those that find you selling things that everyone owns and uses on a daily basis. While these positions are not the highest paying positions, one of the most challenging factors consistent with sales jobs is all but absent. That one challenge is creating a need in the minds of your prospects. Every home and business contains furniture, which means that the owners of those homes and the managers of the offices made a purchase. And when a purchase is made, there is a sales professional working behind the scenes. For those new to sales, a sales position in the furnishing industry is a solid choice. You will be expected to work on your rapport skills and will have plenty of opportunities to both improve and test your rapport skills as prospects freely walk through the front doors of your store. You will also be expected to understand the furnishing industry to some degree and fully expect to learn some of the critical manufacturing designs of the furniture you sell. As for compensation, most home or office furnishing sales professionals receive a base salary and earn either placement fees for each item sold or a percentage of profit from each sale. You will probably be more likely to find employers offering a combination of placement fees and volume bonuses due to stiff competition, the availability of used furnishings from sites like eBay and Craigslist and several online stores offering discounted furniture. Unless you are selling high-end furnishings or moving a massive amount of inventory to many customers or to a few very large customers, don't expect a job in furniture sales to be in the top earning category of sales careers. While compensation in sales should be largely dependent on the sales professional, some careers are not known as those that "pay well." While earning a substantial income may be more challenging while working in the furnishings industry, you will have opportunities that can lead to more financially rewarding positions. The most obvious is to move into sales management, store management, regional or national sales management. There are several sales professionals who earn impressive incomes who started, stayed and earned their way up through home furnishing companies. Another opportunity not to be discounted is the critical sales skills you will have the opportunity to learn, improve and to perfect. 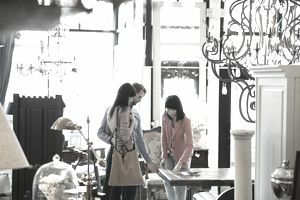 Not only do successful sales professionals in the furniture industry have well-developed rapport skills, but they also are good at closing sales. With many of the people you will see during your work day out "shopping," you will need to have strong closing skills to help them make a purchase instead of walking to your competitor's store. While potential customers may tell you that they are just looking, very few people spend time just looking at furniture and actually are preparing or are prepared to make a purchase. Your task is to help them make an intelligent purchase from you! Furniture sales, like auto sales, is a great entry level sales job and one that can take a successful sales professional far. For those who are not new to sales, exploring sales opportunities in this industry can also be both rewarding and serve as a career building catalyst if you are interested in sales management. The hours may be long and you should fully expect to work late into most evenings, on weekends and holidays as well; making this a tough career for those with families or young children.